A floor scale has many practical uses. A scrapyard uses a floor scale for weighing scrap metal and other recyclable materials. A warehouse uses a floor scale to weigh pallets, boxes and containers. A weigh station uses a floor scale to weigh trucks, motor homes and other vehicles. Because a floor scale has so many diverse applications, different floor scale models feature different optional accessories such as access ramps, wall mounts, floor plates, tripods and extra-long cables. Some floor scale models offer a data interface, like an RS-232 or USB port, to allow the floor scale to transfer data to a computer or printer. In addition, a floor scale may come with software for reporting and analysis. In many instances, data from a floor scale can be exported to software such as Microsoft Excel. 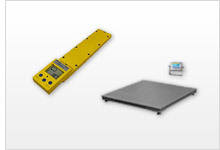 A floor scale can come in a variety of shapes, sizes and weighing capacities. From U-shape to beam and platform scales, the selection of floor scale products available from PCE Instruments is vast. If you have any questions, please contact us at or +44 (0) 2380 987 035 for PCE Instruments UK, or at or +1 (561) 320-9162 for PCE Americas Inc. Mobile Floor Scale with 3 ranges, weight range up to 1,500 kg. Ground Scale with 3 ranges, weight range up to 1,500 kg. PCE-SW 1500N is a portable battery-powered industrial floor scale or pallet scale featuring two heavy-duty parallel weighing beams made of lacquered steel that can be positioned up to 4 m / 13 ft apart. Thus, the adjustable width accommodates multiple pallet, box and container sizes. In addition, the scale's stainless-steel-encased display can be placed up to 5 m / 16 ft away from the weighing beams, allowing for wall mounting. PCE-SW 3000N is a portable battery-powered industrial floor scale or pallet scale featuring two heavy-duty parallel weighing beams made of lacquered steel that can be positioned up to 4 m / 13 ft apart. Thus, the adjustable width accommodates multiple pallet, box and container sizes. In addition, the scale's stainless-steel-encased display can be placed up to 5 m / 16 ft away from the weighing beams, allowing for wall mounting. The floor scale PCE-RS 2000 is designed for stationary use. The robust construction makes this floor scale particularly well suited for weighing large objects. The floor scale is made of painted steel. PCE-PTS 1N is a heavy-duty, pallet truck, pallet jack, warehouse, dock or floor scale used to weigh industrial shipments up to 2000 kg / 4409 lbs / 2.2 Tons. Save precious time by weighing your pallets of merchandise right on the pallet jack. Eliminate the use of a forklift to carry pallets of items to a separate scale for weighing. Weigh your goods right at the dock during loading or unloading. PCE-SW 5000N is a portable battery-powered industrial floor scale or pallet scale featuring two heavy-duty parallel weighing beams made of lacquered steel that can be positioned up to 4 m / 13 ft apart. Thus, the adjustable width accommodates multiple pallet, box and container sizes. In addition, the scale's stainless-steel-encased display can be placed up to 4 m / 13 ft away from the weighing beams, allowing for wall mounting. The floor scale is a verifiable, calibrated U-shaped pallet scale intended for mobile use. The dimensions of the calibrated floor scale are the standard EU size (1200 x 800 mm). The stainless steel U-shaped floor scale is a certifiable scale supplied in calibrated form. The dimensions of the stainless steel U-shaped floor scale are tailored to a range of EU sizes. The calibrated floor scales are ideal if you do not want to put scales into the ground. Simply place the floor scales in the room, fix the floor scales to the ramp with the fixing plates included in the scope of delivery, connect the operating terminal to the socket, and you can start weighing. PCE-WWSB8-S is a portable floor scale consisting of two weighing platforms and a carrying case with a built-in display and printer. Featuring connections for up to four weighing platforms (additional weighing platforms sold separately - see accessories), this floor scale calculates the total weight, wheel load and axle load of a vehicle. PCE-CWC is a portable floor scale designed for use with caravans and trailers to prevent uneven loading and overloading. The floor scale also can be used to weigh motor homes, cars, delivery trucks and other vehicles. PCE-CWC 1.5 is a portable floor scale designed for use with caravans and trailers to prevent uneven loading and overloading. The floor scale also can be used to weigh motor homes, cars, delivery trucks and other vehicles. Mobile Floor Scale with 3 ranges, weight range up to 2,000 kg. The Ground Scale PCE-TPWLKM is a verified forklift that integrates a scale of two ranges. It is verified by Trade Class M III, with a weight range up to 2,000 kg.